Schott NG-type glasses have been used for over thirty years for the validation of the absorbance scale and linearity of a spectrophotometer in the visible region. When manufactured to a specific thickness, filters with a range of transmission and absor­bance values can be produced. 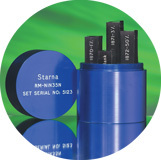 Whilst the spectral scan of these materials is essentially flat, NIST SRM 930e and SRM 1930 certify these glass filters at 440.0 nm, 465.0 nm, 546.1 nm, 590.0 nm, and 635.0 nm. These sets consist of three filters of varying transmission together with an empty aluminium holder, to be used as a blank. Primary Usage: Routine verification of the visible photometric scale. Useable range: 440 nm to 635 nm, instruments with SBW of less than 6.5 nm. Physical Configuration: Glass filters 'stress free' mounted in anodised aluminium holder. Consists of one blank holder and three filters with nominal values of 10 %T, 20 %T,and 30 %T.
. Primary instrumental linearity is established using the Double Aperture method.
. Fundamental traceability links to NIST primary materials are established using SRM 930e and SRM 1930 neutral density glass filters as appropriate.
. All appropriate fundamental parameters and procedures relating to measurement, handling and storage are fully documented on the certificate supplied with each Certified Reference Material. manufactured and certified in accordance with "Technical Specification for the Certification of Spectrophotometric NTRMs" (NIST Special Publication260 - 140).